Figure 3-33. - Standard drop manhole for sanitary or storm drainage systems. Figure 3-32. - Test plugs and test tees. Normally, it is not your responsibility as a Utilitiesman to construct manholes. They are made of concrete or brick; however, you may be working with the Builders in spotting the location for the manholes. Figure 3-33 shows a typical drop manhole. Watertight manholes are made of brick or concrete, 4 feet in diameter at sewer level, and should be placed at junctions and bends in the line. They are spaced preferably 300 feet apart for 8-inch pipe, 400 feet apart for 10- to 15-inch pipe, 500 feet apart for 18- to 48-inch pipe, and 600 feet apart for larger sizes. Sewers should be laid straight to line and grade between manholes, and changes in the size of sewer lines must take place only at the manholes. The crown of the outlet pipe from a manhole should be on a line with or below the crown of the inlet pipe. 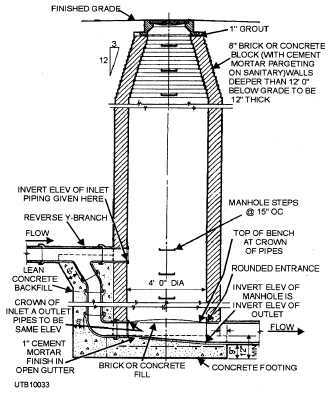 When the invert of the inlet pipe is more than 2 feet above that of the outlet pipe, a drop manhole must be provided to conduct the sewage to a lower level with minimum turbulence. After all pipelines have been laid and tested, they are ready to be covered; this process is known as backfilling and tamping. The method described below should work for sewer lines. Fine material, free from stones and other debris, is tamped in uniform layers with a small hand- or air- operated tamper under, around, and over the pipe. Use a hand shovel to backfill the ditch until the pipe has a 2- foot covering. This fill should be placed in the ditch and tamped in 4-inch layers or less. It should proceed evenly on each side of the pipe, so injurious side pressure cannot occur. Make sure you do NOT walk on the pipe until you have at least 1 foot of soil tamped over the pipe. Until 2 feet of fill has been placed over the pipe, the filling should be done carefully with hand shovels; after that, machinery may be used for faster backfilling. However, do not let the machinery run over the line. Puddling, or flooding, with water to consolidate the backfill should NOT be done for a sewer line. The sections of pipe are in short lengths and tend to settle very rapidly to form pockets or low spots in the line. Q12. What is the required head height for a water test?